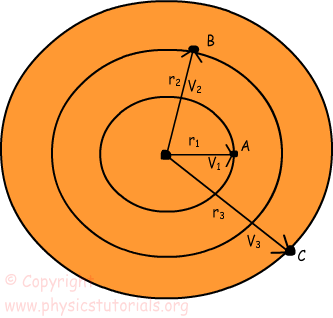 Linear speed and tangential speed gives the same meaning for circular motion. In one dimension motion we define speed as the distance taken in a unit of time. In this case we use again same definition. However, in this case the direction of motion is always tangent to the path of the object. Thus, it can also be called as tangential speed, distance taken in a given time. Look at the given picture and try to sequence the velocities of the points larger to smaller. V=Distance/time If the object has one complete revolution then distance traveled becomes; 2πr which is the circumference of the circle object. Period: Time passing for one revolution is called period. The unit of period is second. T is the representation of period. Frequency: Number of revolutions per one second. The unit of frequency is 1/second. We show frequency with letter f.
Now; with the help of the information given above lets’ sequence the velocities of the points on given picture. 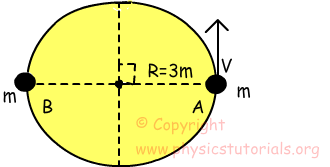 To sum up, we can say that tangential speed of the object is linearly proportional to the distance from the center. Increase in the distance results in the increase in the amount of speed. As we move to the center speed decreases, and at the center speed becomes zero. We use the same unit for tangential speed as linear motion which is “m/s”. 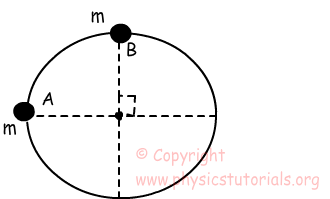 Example: A particle having mass m travels from point A to B in a circular path having radius R in 4 seconds. Find the period of this particle.